To mark the launch of the re-jacketed Old Kingdom series, ahead of next month’s new book in the series with prologue Clariel, here’s cover artist Sebastian Ciaffaglione explaining his process in taking our initial design brief through various iterations to final sketches. 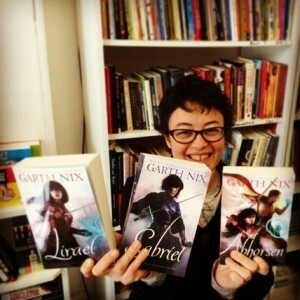 Here’s publisher Eva with the new books when they landed in our office recently, hot off the press. You can find these incredible new editions in shops now! These were the very first roughs Sebastian presented, to show us the sorts of illustrations he might do for all four books. The brief was to provide character portraits that could stand alone, for use in marketing material as well as on the covers. 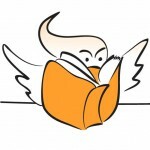 Sabriel has been illustrated many times, so one of the challenges for Seb was to come up with a new vision for the characters, based on his own reading of the books. 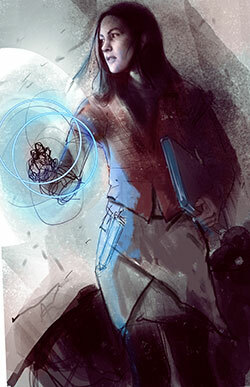 What I sometimes like to do is try to describe a character without mentioning what they look like or what their job is. I find it’s a good way to get to the core of a character. For instance, with Sabriel – I would describe her as brave, stoic, dutiful, altruistic, loyal, responsible and mostly lacking in self pity. She jumps right on board in assuming her responsibilities without even blinking. Even though she doesn’t feel fully up to the task, she proceeds anyway because it is her duty. Her duty means she has to be brave and she has to face nightmares. She has to look horrors right in the eye and fight. I didn’t at any point think this qualified her as a warrior though. She seems to fight because she has to. 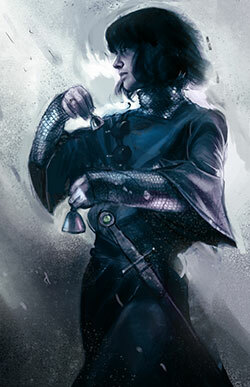 Which is why I originally focused on her bells instead of her sword. 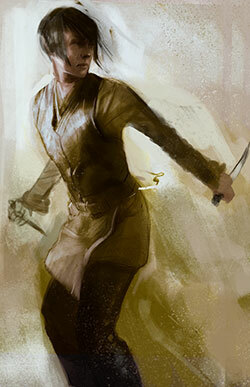 There was much discussion about how active the pose should be – whether to focus more on Sabriel’s inner character, or the adventure elements of the story. In the next rough I tried to instil more of her willingness to fight and her inner strength without having her seem like Xena. 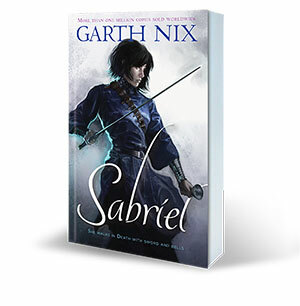 In the final rough Sabriel’s inner strength shines through, yet her warrior stance and sword make it clear this is a story of action and adventure. There was some discussion about whether to include Mogget on the front cover or not; in the end we decided to focus on only the main characters on the front covers, and include the companions elsewhere. 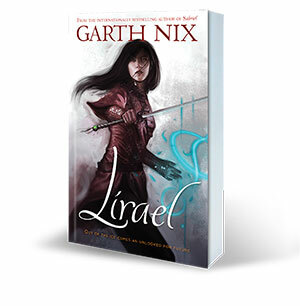 Lirael is my favourite character. I completely adore her. I would describe her as isolated, melancholy, curious, talented, good-hearted and most of all lonely. 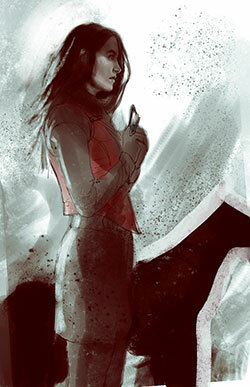 In the first rough, where she is facing in profile, I wanted the reader or audience to want to hug her like I do. I want them to look at her and not so much feel sorry for her, but appreciate that she may be a little deeper than a straightforward fantasy heroine. It is her and her dog versus the world. Together, they will satisfy her curiosity and find hidden treasures. When she is afraid, her Disreputable Dog will help her find courage. 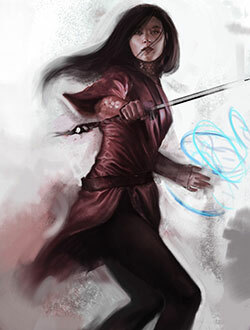 The second Lirael rough is meant to emphasis more her curious nature and latent magical talents. 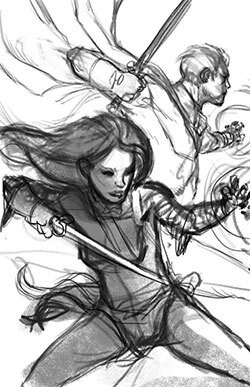 The final rough shows Lirael’s warrior side, and as with Sabriel, the sword and charter marks send a strong message of fantasy and adventure. Sameth is extremely talented, and does his best to fulfil his obligations. 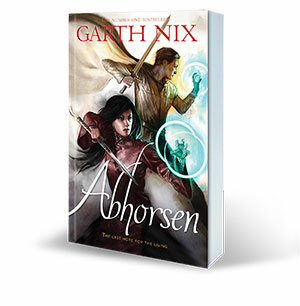 Really though he is a master builder and not an Abhorsen – he’s a world-class artisan, the embodiment of builders. Rather than just have the man be standing there tough as nails with a sword (though he can be pretty tough) I wanted to emphasise this other, more interesting (to me, anyway) aspect of his character. 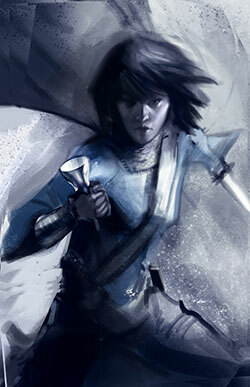 I wanted to show Lirael developing into a character more powerful and heroic. 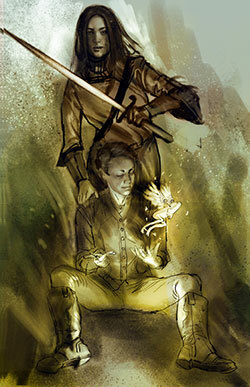 In this rough I like to think they are by a campfire and Sam is tinkering with some mechanical miracle, while Lirael has the sword and is alert, tapping him on the shoulder as if to warn him of a nefarious presence. In the end, the decision was to go with a more active pose, showing Sameth and Lirael back to back, facing off against an unknown danger. After doing the rough drawing I like to get an idea of the temperature of the painting by splashing colour around until I like it. 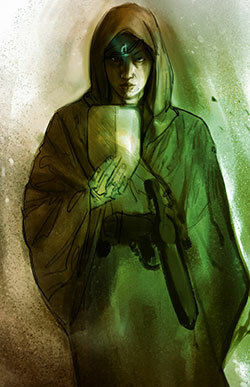 Then I put that away and drop all the colour out and work on the value structure. If you can get your painting to work in black and white then it will work no matter what colours you lay on top. After that it is a slow back and forth process of adding rough chaos, then refining, and then back to adding more mess and so on until it’s time for final details. 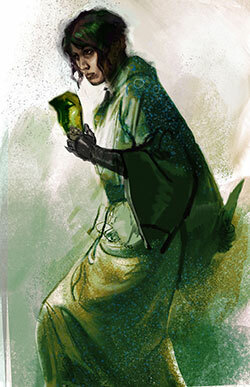 An early rough for Clariel, showing her in hunting gear. 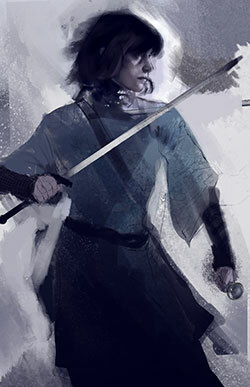 An alternative rough for Clariel, dressed in protective robes and suggestive of dark magic. 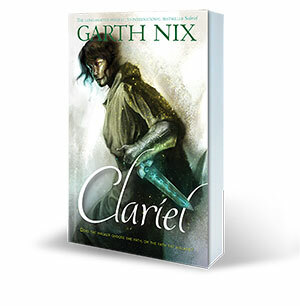 I think Clariel is 100% fighter. She is literally a Berserk. She is the student who brings a weapon to school. She has violent thoughts against her own family in some scenes. She is independent. She is focused, strong, true neutral and nature loving. I see her a bit like the Hulk. She just wants to be left alone to do her own thing and people keep coming along and heaping obligations on her. I wanted to imply her future in the series. That maybe she doesn’t quite end up as altruistic as some of the other Abhorsens-in-Waiting. She will cut you if she needs to, but mostly I think she wants to just walk away from you. Close to final, but with her mask off. 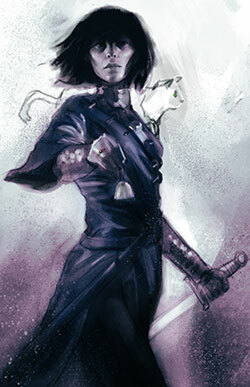 After studying illustration at NMIT Sebastian Ciaffaglione began a freelance art career based out of Melbourne. A strong desire to push his own artistic boundaries, striving always to improve and learn, has formed his reputation as a versatile artist who emphasises professionalism and flexibility. Sebastian has kindly permitted us to use some of the illustrations that were ‘left on the cutting room floor’ to help us show some aspects of the cover design process.